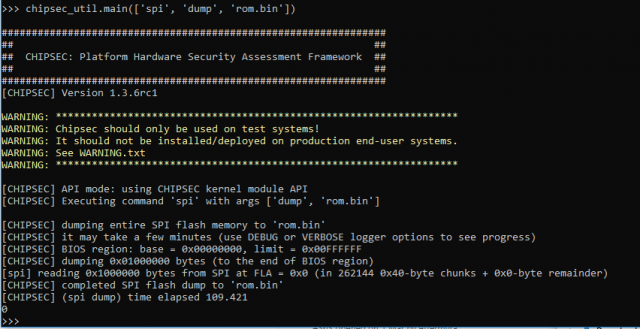 What does CHIPSEC Platform Security Assessment Framework Do? CHIPSEC has a bunch of modules focusing on areas such as Secure Boot, System Management Mode (SMM/SMRAM), BIOS and Firmware security, BIOS write protection etc. 1. CHIPSEC kernel drivers provide direct access to hardware resources to user-mode applications (for example, access to physical memory). When installed on production systems this could allow malware to access privileged hardware resources. 2. The driver is distributed as source code. In order to load it on Operating System which requires kernel drivers to be signed (for example, 64-bit versions of Microsoft Windows 7 and higher), it is necessary to enable TestSigning (or equivalent) mode and sign the driver executable with test signature. Enabling TestSigning (or equivalent) mode turns off an important OS kernel protection and should not be done on production systems. 3. Due to the nature of access to hardware, if any CHIPSEC module issues incorrect access to hardware resources, Operating System can hang or panic.